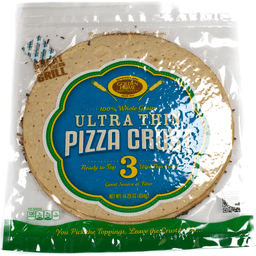 Golden Home® Ultra Thin Pizza Crust. Resealable pouch for freshness. Great on the grill. Homestyle baking. Bakery products. Since 1937. 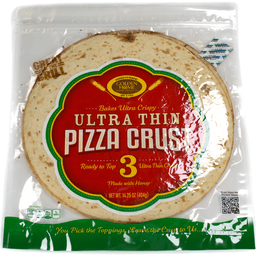 Bakes ultra crispy.... Ready to top 3 ultra thin crusts. Made with honey. Per serving: 130 calories. 0g sat fat, 0% DV. 85mg sodium, 4% DV. 1g sugars. You pick the toppings. Leave the crust to us... Phone: 1-877-450-1725. Email: customerservice@quakerbakery.com. 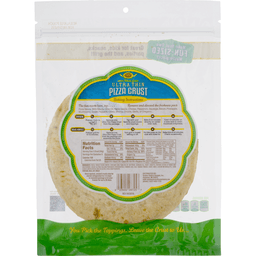 Golden Home® 100% Whole Grain Ultra Thin Pizza Crust. Resealable pouch for freshness. Great on the grill. Homestyle baking since 1937. Bakery products. 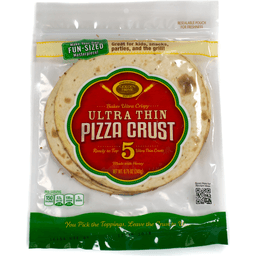 Ready to top ultra thin crusts. 3 good source of fiber. 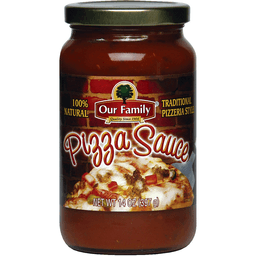 Per serving: 130 calories. 0g sat fat, 0% DV. 75mg sodium, 3% DV. 1g sugars. You pick the toppings. Leave the crust to us... Phone: 1-877-450-1725. Email: customerservice@quakerbakery.com.